This is a fun, easy craft idea and is well timed since Peeps are all over stores for Easter. All you need is a package of yellow peeps, lollipop sticks and edible pens (you can find both of those things at a craft store). 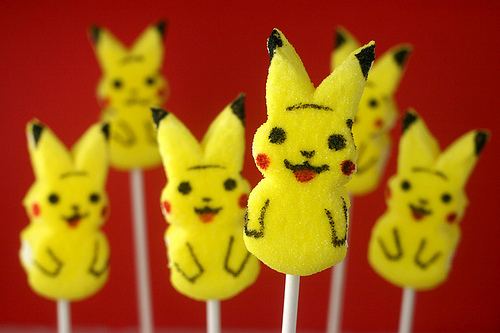 If you love Pokemon or know someone who does, you will have so much fun creating Peep-achus! Check out the tutorial here. Friday Crafternoon- Giant Indestructible Bubbles! No one is ever too old to enjoy bubbles- but have you tried making them yourself? It is surprisingly easy to make bubble solution from scratch, and with ingredients that are easy to find around the house or at the supermarket. 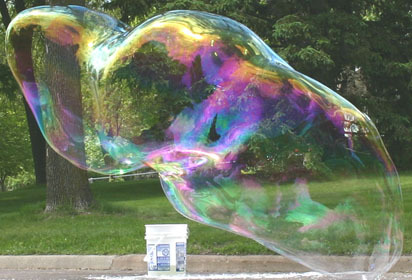 Check out this recipe for giant, hard-to-pop bubbles! A tip: add some glycerin (a main ingredient in soap, found at craft stores) to make them even stronger! Got the Winter Blues? Take some time and make some slime! This craft is super easy, gross, and fun. Try it by yourself or with your friends! Tween Program re-cap: Apple Smiles! Today we had a Tween program (for students in 4th through 8th grade) and we made Apple Smiles! They were messy but delicious. You can find a recipe like the one we used here.